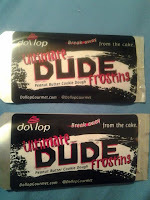 Dollop Gourmet : Dollop is the only gourmet cupcake bar in Rochester, NY and a proud winner of Food Network's Cupcake Wars. As frosting aficionados we choose to focus on the fun of toppings, atop a variety of delectable cupcakes. The brainchild of Heather Saffer, Dollop gives customers the freedom to create their own cupcakes, further promoting the sensibility that it’s really all about the topping! With an array of cakes, fillings, frostings, and toppings, Dollop is a dessert creator’s dream, truly allowing them to Break Away from the Cake™. From chocolate cake with dark chocolate ganache filling, fresh strawberry frosting, and dark chocolate chunks swimming to classics such as red velvet with raspberry sauce filling, cream cheese frosting, and graham crackers, each customer has the power to make their cupcake come alive before their eyes. (Read More) . You probably know Dollop Gourmet best from winning one of my favorite "Foodie Reality" TV shows Food Network’s Cupcake Wars, I was more then a little excited when Heather personally sent me a E-Mail asking me if I wanted to do a review/giveaway for one of her new products - Frosting - Spread Dollop's Frosting Spread is the first Gourmet frosting in a squeezable pouch of its kind to hit the store shelves. Our creamy, velvety butter cream frosting spread is the perfect accompaniment to any food, be apples, pretzels, graham crackers, cupcakes, or even bacon! By taking our Food Network award winning Ultimate Dude Peanut Butter Chocolate Cookie Dough cupcake and transforming it into a frosting spread, we've proven that life is all about the topping and it's finally time to Break Away From the Cake™. As I have stated before, I'm a huge sweets lover, I love everything from chocolate, to hard candies, to sweet drippy things.. So I am first in line to try something new, I am usually the first to go straight for the cupcakes, and cakes, but recent health issues have got me to re-think the way I have been eating. (I still sneak cupcakes in once in awhile tho). So I have been finding new ways to satisfy my sweet tooth cravings other then indulging in battered well, everything. I love my fruits, but sometimes plain ol' fruits get boring and I want something to change it up. So after Heather sent me an e-mail asking if I would like to review the Frosting Spread, I went and did some research on the product, which was perfect for spicing up my boring apples that I have been munching on when I have a sweet tooth. 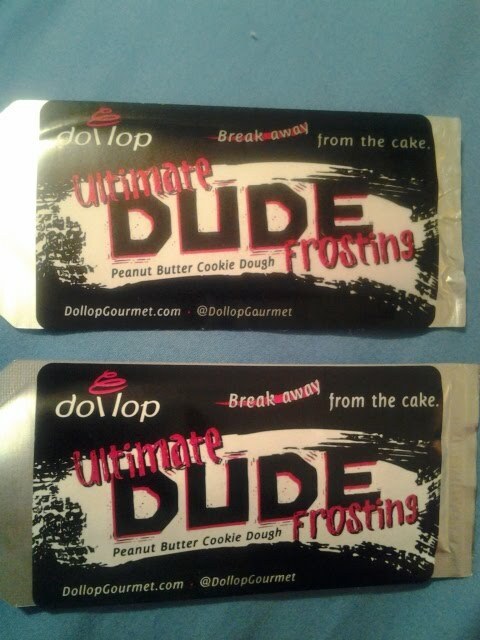 The Dollop's Ultimate DUDE frosting in the flavor of Peanut Butter Cookie Dough. I'm usually NOT a peanut butter fan, but this has took my breath away. As you can see I decked out my apple in the Dollop's Ultimate DUDE frosting in the flavor of Peanut Butter Cookie Dough. When I first squeezed it out I could really smell the peanut butter, I was a little shy of it at first because I was expecting a strong flavor of nothing but peanut butter, but I perked up as soon as I tasted it. It tasted like the name says "Peanut Butter Cookie Dough" It had a creamy texture, and tasted like I was scooping up some cookie dough right out of the cookie dough tubes. Yum! I quickly bit off the end of the apple and I was in heaven. My apple tasted like a cookie dough caramel apple! (without the mess). I couldn't believe how good this tasted. I want my Husband to taste how good this stuff is, but it is so tempting to open the other pocket pack and eat it myself. I will for now on "Break Away from the cake". Buy some! Dollop Gourmet "shop". Heather is Giving (2) of my readers (2) Frosting Spread Pocket Packs each as a giveaway! (Claps in excitment)!! Check out the "GIVEAWAY" page to enter. ♥ You can find Dollop on Facebook - Here. ♥ You can find Dollop on Twitter - Here. ♥ You can find Heather's blog - Here. ♥ You can find Heather's Twitter - Here. ♥ I receive no monetary compensation for this review. I was provided Dollop Gourmet to try and give my honest opinion. Preheat the oven to 300 degrees F. Line 2 cupcake or muffin pans with 18 cupcake liners. Sift the flour, sugar, cocoa powder, baking soda, baking powder and salt in a large bowl. Add the buttermilk, warm water, applesauce, vanilla extract and eggs, and mix until well combined. Fill the cupcake liners three-quarters full with batter and bake or until a toothpick inserted into the center comes out clean, 18 minutes. Cool the cupcakes completely. To assemble: Cut a hole in the center of the chocolate cupcakes with a paring knife. Scoop 1/2 tablespoon of Cookie Dough Filling into the center. Replace the piece of cake you cut out. Generously frost the top of the cupcake with the Peanut Butter Frosting. Drizzle with store-bought caramel sauce and sprinkle with kosher salt. Place the Fondant Covered Chocolate Chip Cookie Tire on top. Combine the flour, baking soda and salt in a small bowl and set aside. In the bowl of an electric stand mixer with the paddle attachment, beat the butter with the brown sugar, granulated sugar and vanilla extract until creamy. Add the milk and mix. Gradually beat in the flour mixture. Stir in the chocolate chips by hand. Divide in half and set one half in the cooler to chill. Reserve the other half for the Fondant Covered Chocolate Chip Cookie Tires. Yield: about 3 cups. Cream the butter and add the peanut butter and mix until blended. Add the vanilla and continue mixing. Sift in the powdered sugar and whip until soft and fluffy. Put the frosting in a pastry bag and cut 1/2-inch off the tip. Yield: about 3 cups. Bake the reserved Cookie Dough Filling in the oven until golden brown, 9 to 11 minutes. Remove from the oven and allow to cool. Cut out circles of cookies with a circular cookie cutter. Roll out the fondant and cut out circles of fondant with a circular cookie cutter slightly larger than the cutter you used for the cookies. Wrap the fondant circle around the cookie circle. Stick 1 white chocolate candy melt in the center of the fondant so that it sticks. Using the "v" point of a star-shaped cookie cutter, press "tire treads" all around the sides of the cookie.